Today we are interviewing Don Holbrook about his book, "The Next America: How to Survive and Thrive in Today's Unpredictable Economy." On sale for 99 cents during July 2015 - click here to buy! Don Holbrook is the Author of ten non-fiction books related to economic development and economic stimulus practices to stimulate American jobs and economic quality of life. He spent 25 years as a CEO Level executive in the economic development industry and negotiator of major economic incentives to stimulate and rebuild local economies. What drew you to the field of economics? I wanted to use my formal training for something other than making money for people on Wall Street, so I felt creating incentives that could put Americans back to work would be personally and professionally fulfilling. To educate people on how to understand what to advocate for with regard to government reform so that they know what needs to be fixed and why… Then to allow them have the knowledge to now know what will work better and why it is fundamentally important to all Americans. The rebuilding of the American Dream can only occur using Capitalism, the more we move to liberal socialism the deeper problems we will be forced to endure. Fixing our countries problems does not necessitate draconian changes but rather realistic changes that most Americans support. Advocacy requires that all of us decide to be either part of the problem or part of the solution. Anyone that is concerned about the future of our great nation and the very dysfunctional electoral system we have now allowed to be created. In addition the book speaks to how normal people can both survive during these unpredictable economic times and also thrive financially on the knowledge that the book will enlighten them on with regard to their own households. What inspired you to write a book about what people need to do to survive in today’s unpredictable economy? Being home in my hometown of Dayton Ohio for my class reunion and hearing that nearly half of my high school class was now unemployed because of failed economic leadership and vision in my hometown. I felt to sit back and not say something was simply wrong and would only allow these type of problems to continue and plague the hard working people of our country. Do you think Americans are gaining more or less faith in the economy? They have very little confidence in longterm economic security and for the first time they feel less optimistic about their own economic future than their parents generation… what this shows me is the very fabric of our great nation built upon the confidence of our people in themselves is shattered. People are holding on and surviving on precarious means of making money and are very untrusting of government. They feel sold out, they feel that government only listens to corporate donors and no longer is in touch with them as taxpayers. The worst situation is that they feel helpless to actually do anything about it. If we allow this current unresponsive relationship to continue our nation will lose any hope of restoring the American Dream and I believe will slide into a scenario of liberal socialism, which will be the death nail on our competitive capitalism dominance as an economic superpower. How have economic problems abroad, such as the recent situation in Greece, impacted the average American’s perception of the attainability of the American Dream? Most American’s don’t understand or know how a national meltdown would affect them so they really think of it more as bad media joke that they must listen to constantly. They do not understand that the failure of that economy is just the tip of the iceberg of the domino effect of the next and then the next national economy going into failure. This can create a severe hyperinflation outcome that will once again wipe out the economic system, just as most Americans are figuring out how to get a little bit of economic traction in the post 2008 great recession. The result could be the tail end of the worst economic nightmare of this century. What are some of the things that Americans should advocate for to get the nation back on a pattern of sustainable growth? It all has to start with responsible government. The only way to do that is to install term limits on all elected positions and then require a balanced budget coupled with a government that is made to live on it’s income and not future obligations that are unfulfillable. The second biggest challenge is to abolish the IRS in favor of a modern tax code that incentivizes economic investment, job creation and entrepreneurial wealth creation. By creating a flat and fair national, state and local sales tax and doing away with income taxes and property taxes, which came from the medieval ages. A flat and fair consumption or sales tax would tax everyone on every transaction whether illegal, legal or just visitors. Then using a flat payroll or workforce voucher system for the benefits we need that can regulated by the Feds but managed by the individual. Creating a competitive system would create the largest economic boon since the industrial revolution. The single greatest economic stimulus the US government could do to stimulate this economy is to abolish the IRS in favor of a fair, flat tax, because it would give us the most competitive tax code in the world and investments would flow here seeking such a lucrative and stabile economic climate. This would stimulate jobs like never before. Without the knowledge of what is broke and how to fix it you cannot advocate for what you believe or want from our elected officials. If you do not know what to stand for then you will remain confused and unaware of the profound problems we face and how they will harm you very soon yet again. Second book will be about how we can individually use this knowledge in the likely scenarios to get our own family and personal economic wealth back on track even if they refuse to make the changes that most Americans actually support. To be an American citizen is something most of us have just taken for granted. If we do not learn how to get what we need from our government and the upper class continues to get richer and richer at the expense of the middle and lower class it will eventually lead to severe social upheaval and economic chaos. You can only push people down for so long before a huge outcry occurs. I believe the second revolutionary war could come about strictly because we have allowed our nation to slip away from what we all held as tenets of our own collective and individual greatness. 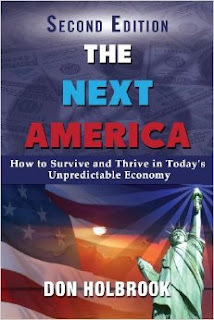 Book Trailer for "The Next America: How to Survive and Thrive in Today's Unpredictable Economy"